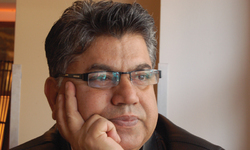 Naveed Asghar, CMO, HBL, talks about their recent ’70 years of Pakistan’ campaign. Mamun M. Adil speaks to Naveed Asghar, Chief Marketing Officer, HBL, about their recent campaign which is primarily being rolled out in ‘70 Years of Pakistan & DAWN’ – a series of 16 special reports published by DAWN from August 19 to December 25, 2017. 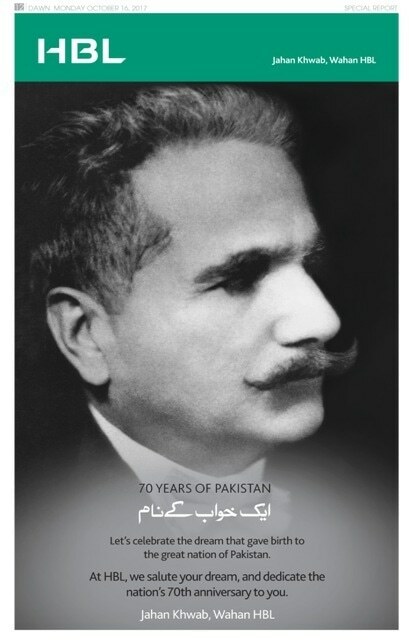 MAMUN M. ADIL: What prompted HBL to roll out their ‘70 years’ campaign at the same time as ‘70 Years of Pakistan & DAWN’? NAVEED ASGHAR: HBL, Pakistan’s largest bank, has been an integral part of the nation’s fabric from the time the country came into being. HBL was the first commercial bank to be established in the Subcontinent in 1941; it has therefore been inextricably linked with the origin of Pakistan and has consequently played a significant role in the nation’s economic progress. 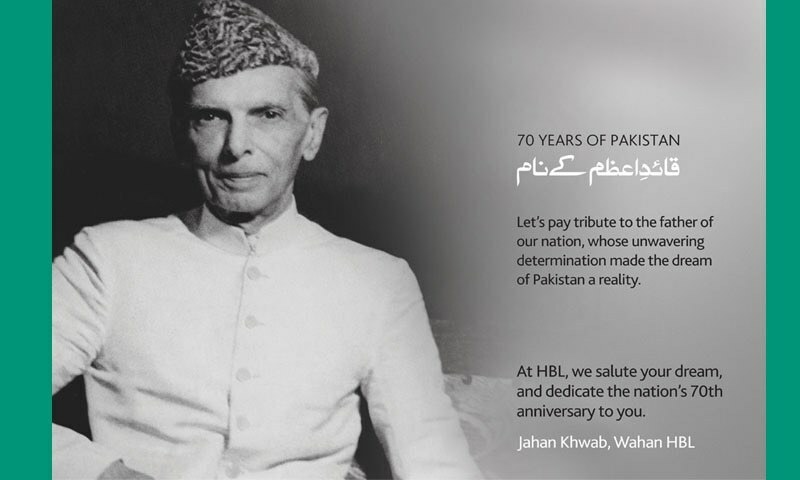 Being the ‘Bank of the Nation’, it was inevitable for HBL to roll out a 70 years’ celebratory campaign. Like HBL, Pakistan’s first English-language newspaper – DAWN – has played a significant part in Pakistan’s journey from the very beginning. Hence, the campaign is an inspiring and natural fit for not only HBL and DAWN, but also the nation as we present a memorable 70 years independence campaign. MMA: What are the campaign’s objectives? NA: The campaign, which was designed by JWT Pakistan, has two major objectives. Firstly, it provides our youth the opportunity to find out more about their roots, since the campaign highlights historic moments, as well as the instrumental role that HBL has played over the last seven decades. Secondly, through this campaign, HBL salutes all the dreamers for daring to dream as well as achieving their dreams and in doing so, leaving a positive mark in the nation’s history. MMA: What were the criteria with regard to choosing the theme of the campaign? NA: At the core of HBL is our philosophy of enabling dreams and enriching lives and this is reflected in every communication of the brand and is vital in building the brand across our growing network. Taking our philosophy forward, we picked a theme which pays tribute to our nation at large by identifying all those dreamers who have made Pakistan a thriving country by enabling dreams and enriching lives in a significant way. More importantly, it is these dreamers who will play a substantial part in building a brighter future of the nation. MMA: So far, the campaign has chosen to focus on the founding fathers of Pakistan, teachers and farmers; what was the rationale behind choosing these people and what will subsequent advertisements focus on? NA: Our campaign is not only about remembering the heroes or icons of the nation, but each and every Pakistani who loves his or her country infinitely. We are forever grateful to our founding fathers for giving us this great country, but at the same time we are indebted to our farmers, teachers, students, scientists, doctors and young people who are the reason why Pakistan is still doing so well despite everything. MMA: How has the response been so far? NA: Although it is pre-mature to say conclusively, the response has been overwhelmingly positive so far and we hope that the same impetus will continue until the campaign ends. HBL core business is closing overseas branches and losing billions due to money laundering.. It should celebrate well the 70 years. With the way it's going it may not be there for the 75 years. failed bank heavy fines imposed by DFS N.Y. a prime example of lack of oversight. Great and inspiring endeavour indeed ! Never learnt about real stuff in curriculum. 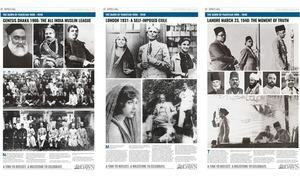 Must be made part of "Pakistan Studies" as curriculum.